We have a number of combination locks suitable for all weather / environments but this is the lowest in cost and yet doesn't compromise in corrosion resistance. Sometimes simple is better! In our tests they just kept on performing even when continually sprayed with very salty water. We're particularly impressed with what Shield has managed to achieve here and it is equally weather resistant to the more expensive models! On top of that the popular sailing magazine did a review of all the major marine padlock brands and this model came out Best In Test! Although it is our smallest weather grade combination padlock, as you can see below, it is actually fairly chunky lock with quite abit of weight behind it. 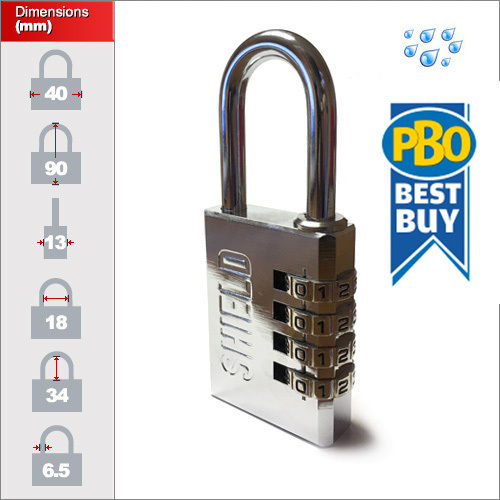 Note that this lock is what we would regard as low security due to its small size. It is ideal for small outdoor gates, sheds, boats lockers, external storage boxes and so forth. If you need something a little more secure then consider the ABUS 180ib or the Masterlock Stainless. The shackle and mechanism of this lock are stainless but the lock body is chrome plated brass and performs equally well in salt water compared to stainless steel. The simple design makes it especially resilient against salt crystals as it only uses non corrosion metals. We're quite confident it came be used in a marine / saline environment.